I’d like to introduce a new section of my blog today which is going to focus on the stories behind all those infographics we keep seeing popping up around the web. Of course, my focus is going to be on those that are related to books, publishing, writing and the author and I do hope that you’ll find them as fascinating as I do. The first one I’d like to show you was created by Visual Loop, it is based on an original piece of research created by Bain and Company, called Publishing in the Digital Era. With the emphasis of Amazon on pushing it’s Kindle reader to users via the website, tv and publication advertising, it would be easy to assume that this is all there is when it comes to reading. In fact, the birth of the eReader device has spawned a whole host of apocalyptic predictions about the end of the publishing industry as we know it; the doomsayers inform us that soon we won’t have printed books and that no-one reads anyway now that Facebook and Twitter rule the household. 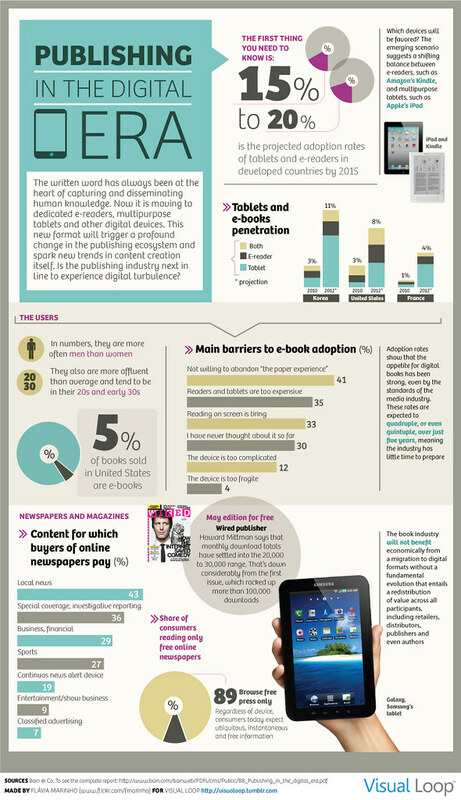 My feeling is that people who haven’t traditionally been readers are now more likely to become readers because of the ease of access that tablets and eReaders give them. What do you think?